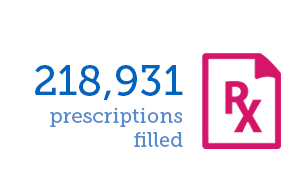 Based in western Massachusetts, Baystate Health is a not-for-profit, multi-institutional, integrated health care organization serving over one million people throughout western New England. 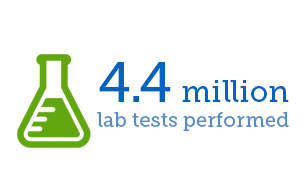 Baystate Health, with a workforce of over 11,500 employees, is the largest private employer in the region and includes the entities that follow. Baystate Medical Center in Springfield is an academic, research, and teaching hospital that serves as the Western Campus of Tufts University School of Medicine. As a major referral care center and the only Level 1 trauma center and pediatric trauma center for western Massachusetts, it is home to one of New England’s busiest emergency rooms. Baystate Medical Center, home to the Baystate Heart & Vascular Program and the Baystate Regional Cancer Program, among a host of advanced specialty medical, diagnostic, and surgical services, is a Leapfrog Top Hospital for Quality and Safety, a 2014 Truven® Healthcare Analytics 100 Top Hospital, Major Teaching Hospital, a 50 Top Cardiovascular Hospital, a Magnet hospital for nursing excellence and a U.S. News & World Report Best Hospital. As the only accredited children’s hospital in the region, Baystate Children’s Hospital provides a comprehensive range of pediatric primary care and inpatient and outpatient sub-specialty services. Among Baystate Children’s Hospital’s Springfield-based services are the region’s only neonatal and pediatric intensive care units, the Family Advocacy Center, the Sadowsky Family Pediatric Emergency Department, and the Baystate Children’s Specialty Center. Located in Greenfield, MA, Baystate Franklin Medical Center is a 90-bed acute care hospital providing inpatient and outpatient services to residents of Franklin County and surrounding communities. Specialized programs include wound and hyperbaric medicine, heart and vascular care, cancer care services, family-centered obstetrical care, sports medicine, multi-specialty medical and surgical services, inpatient behavioral medicine, and 24-hour emergency services. Baystate Franklin was recognized recently in U.S. News & World Report for its Get With The Guidelines Achievement Award for successfully using evidence-based guidelines for patient care. Baystate Mary Lane Hospital in Ware is a 25-bed community hospital that is ranked by Professional Research Consultants (PRC) in the top 10 percent nationally for patient satisfaction with overall quality in emergency services and medical/surgical care. A recipient of the American Heart Association Get With The Guidelines® Stroke Silver-Plus Quality Achievement Award, the hospital offers 24-hour emergency care (including a pledge that patients will see a provider within 30 minutes of arrival), intensive care, inpatient and outpatient surgical care, orthopedics, and cancer services through the Baystate Regional Cancer Program. 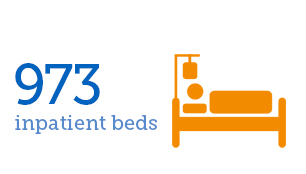 Baystate Health welcomed Palmer-based Wing Memorial Hospital in September 2014. 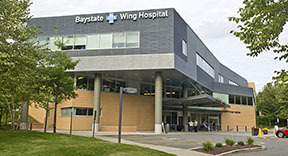 Now called Baystate Wing Hospital, the 74-bed community hospital offers five community medical centers employing about 800 medical and support personnel and offering 24-hour emergency care as well as a broad range of medical, surgical, and adult & geriatric inpatient psychiatric services. The hospital includes the Griswold Behavioral Health Center, providing comprehensive outpatient behavioral health and addiction recovery services, and the Baystate Wing Visiting Nurse Association & Hospice. Baystate Medical Practices is a multi-specialty, community-based and academic practice that includes over 580 physicians and advanced practitioners providing care at over 50 locations throughout the Pioneer Valley. Physicians serve as faculty for the Tufts University School of Medicine (TUSM), for which Baystate Medical Center is its Western campus, and are the principle educators and mentors for over 320 Baystate Medical Center residents and fellows as well as the TUSM third and fourth year medical students. Baystate Visiting Nurse Association & Hospice is the area’s largest home health care and hospice agency, serving patients and families throughout western Massachusetts. 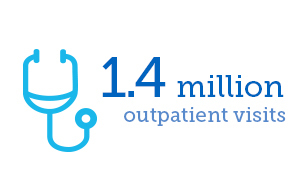 Caregivers provide specialty care in heart failure and other chronic illness management, joint replacement rehabilitation, wound management, telemedicine, and palliative care in a patient’s own home. Baystate Home Infusion & Respiratory Services provides a wide range of infusion care, enteral tube and oral feeding products, respiratory care (including oxygen, sleep apnea treatment, and ventilator care) and durable medical equipment to patients throughout western Massachusetts and northern Connecticut. It includes two retail stores offering a range of medical equipment and supplies, from wheelchairs, lift chairs, scooters, to home safety products. Baycare Health Partners Inc. is a physician/hospital organization that includes the four Baystate Health hospitals and about 1,300 physicians in about 200 medical practices in Hampden, Hampshire, and Franklin counties. Baycare® fosters physician/hospital cooperation and provides managed care contracting services for members. In May 2012, Baycare® formed a subsidiary, Pioneer Valley Accountable Care, LLC (PVAC), an accountable care organization with the goal to reduce the cost of care while improving quality and the patient experience. PVAC began participating in the Centers for Medicare & Medicaid Services Medicare Shared Savings Program in January 2013 and serves approximately 30,000 Medicare beneficiaries. Health New England, based in Springfield, is one of the largest managed care organizations in the region, consistently rated as one of the top health plans in the country. HNE serves more than 140,000 members in a service area that includes Franklin, Berkshire, Hampden, and Hampshire counties as well as part of Worcester County. HNE offers a wide range of products to meet all employer group and individual needs including: commercial insurance, Medicare Advantage, and Medicaid. In 2015, HNE will be expanding its Medicare Advantage Service Area to include Hartford County, CT, and increasing its commercial insurance presence in all of Worcester County.